With more than 2,000 clean-air buses operating throughout LA County, Metro relies on an extensive team of Bus Operators to carry out our mission every day. Bus Operators are at the core of Metro service and gain valuable experience for careers in transportation. All part-time Operators start at $15.82 per hour. Pay rate increases incrementally according to the union contract. Top wage is $24.34 after 48 months. 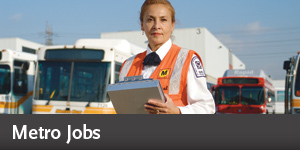 Visit jobs.metro.net and follow instructions to apply online. If your skills meet the qualifications, Metro Talent Acquisition will contact you to schedule an interview. Once you have cleared pre-employment, you will be scheduled for on-boarding and eight weeks of paid training at Metro. During training, you will take a written and road test to obtain your Class B license.